The Hungarian Revolution of 1848 (Hungarian: 1848–49-es forradalom és szabadságharc, "1848–49 Revolution and War") was one of the many European Revolutions of 1848 and closely linked to other revolutions of 1848 in the Habsburg areas. The revolution in the Kingdom of Hungary grew into a war for independence from the Austrian Empire, ruled by the Habsburg dynasty. 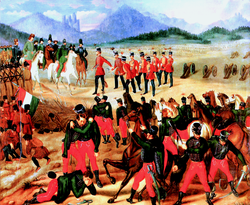 After a series of serious Austrian defeats in 1849, the Austrian Empire came close to the brink of collapse. Thus, the new young emperor Franz Joseph I had to call for Russian help in the name of the Holy Alliance. Tsar Nicholas I answered, and sent a 200,000 strong army with 80,000 auxiliary forces. Finally, the joint army of Russian and Austrian forces defeated the Hungarian forces. After the restoration of Habsburg power, Hungary was placed under brutal martial law. The Kingdom of Hungary had always maintained a separate parliament, the Diet of Hungary, even after the Austrian Empire was created in 1804. The administration and government of the Kingdom of Hungary (until 1848) remained largely untouched by the government structure of the overarching Austrian Empire. Hungary's central government structures remained well separated from the imperial government. The country was governed by the Council of Lieutenancy of Hungary (the Gubernium) - located in Pozsony and later in Pest - and by the Hungarian Royal Court Chancellery in Vienna. The frequent diets held in the earlier part of the reign occupied themselves with little else but war subsidies; after 1811 they ceased to be summoned. In the latter years of Francis I the dark shadow of Metternich's policy of "stability" fell across the kingdom, and the forces of reactionary absolutism were everywhere supreme. But beneath the surface a strong popular current was beginning to run in a contrary direction. Hungarian society, not unaffected by western Liberalism, but without any direct help from abroad, was preparing for the future emancipation. Writers, savants, poets, artists, noble and plebeian, layman and cleric, without any previous concert, or obvious connection, were working towards that ideal of political liberty which was to unite all the Magyars. Mihály Vörösmarty, Ferenc Kölcsey, Ferencz Kazinczy and his associates, to mention but a few of many great names, were, consciously or unconsciously, as the representatives of the renascent national literature, accomplishing a political mission, and their pens proved no less efficacious than the swords of their ancestors. The alarm of the government at the power and popularity of the Liberal party induced it, soon after the accession of the new king, the emperor Ferdinand I (1835–1848), to attempt to crush the reform movement by arresting and imprisoning the most active agitators among them, Lajos Kossuth and Miklós Wesselényi. But the nation was no longer to be cowed. The diet of 1839 refused to proceed to business till the political prisoners had been released, and, while in the Lower Chamber the reforming majority was larger than ever, a Liberal party was now also formed in the Upper House under the leadership of Count Louis Batthyány and Baron Joseph Eotvos. From 1000AD up to 1844, Latin language was the official language of administration, legislation and schooling in Kingdom of Hungary. Two progressive measures of the highest importance were passed by this diet, one making Magyar the official language of Hungary, the other freeing the peasants' holdings from all feudal obligations. Immediately before the elections, however, Deák succeeded in reuniting all the Liberals on the common platform of "The Twelve Points". The ensuing parliamentary elections resulted in a complete victory of the Progressives. This was also the last election which was based on the parliamental system of the old feudal estates. All efforts to bring about an understanding between the government and the opposition were fruitless. Kossuth demanded not merely the redress of actual grievances, but a liberal reform which would make grievances impossible in the future. In the highest circles a dissolution of the diet now seemed to be the sole remedy; but, before it could be carried out, tidings of the February revolution in Paris reached Pressburg on the 1st of March, and on the 3rd of March Kossuth's motion for the appointment of an independent, responsible ministry was accepted by the Lower House. The moderates, alarmed not so much by the motion itself as by its tone, again tried to intervene; but on the 13th of March the Vienna revolution broke out, and the Emperor, yielding to pressure or panic, appointed Count Louis Batthyány premier of the first Hungarian responsible ministry, which included Kossuth, Széchenyi and Deák. The Ten Points, or the March Laws as they were now called, were then adopted by the legislature and received royal assent on 10 April. Hungary had, to all intents and purposes, become an independent state bound to Austria only by the Austrian Archduke as Palatine. The new government approved a sweeping reform package, referred to as the "April laws", which created a democratic political system. The newly established government also demanded that the Habsburg Empire spend all taxes they received from Hungary in Hungary itself, and that the Parliament should have authority over the Hungarian regiments of the Habsburg Army. The first general parliamentary elections were held in June, which were based on popular representation instead of feudal forms (Estates General) The reform oriented political forces won the elections. The electoral system and franchise were similar to the contemporary British system. After the Austrian revolution in Vienna was defeated, Franz Joseph I of Austria replaced his uncle Ferdinand I of Austria, who was not of sound mind. Franz Joseph didn't recognise Batthyány's second premiership, which began on 25 September. Also, Franz Joseph was not recognized as "King of Hungary" by the Hungarian parliament, and he was not crowned as "King of Hungary" until 1867. In the end, the final break between Vienna and Pest occurred when Field-Marshal Count Franz Philipp von Lamberg was given control of every army in Hungary (including Jelačić's). He went to Hungary where he was mobbed and viciously murdered. Following his murder the Imperial court dissolved the Hungarian Diet and appointed Jelačić as Regent. Hungarian liberals in Pest saw this as an opportunity. In September 1848, the Diet made concessions to the Pest Uprising, so as not to break up the Austro-Hungarian Union. But the counter-revolutionary forces were gathering. After many[quantify] local victories, the combined Bohemian and Croatian armies entered Pest on 5 January 1849. The Habsburg government in Vienna proclaimed a new constitution, the so-called Stadion Constitution on 4 March 1849. The centralist Stadion Constitution provided very strong power for the monarch, and marked the way of neo-absolutism. The new March Constitution of Austria was drafted by the Imperial Diet of Austria, where Hungary had no representation. Austrian legislative bodies like the Imperial Diet traditionally had no power in Hungary. Despite this, the Imperial Diet also tried to abolish the Diet of Hungary (which existed as the legislative power in Hungary since the late 12th century.) Moreover, the Austrian Stadion constitution also went against the historical constitution of Hungary, and tried to nullify it too. Kossuth played a key role in tying down the Hungarian army for weeks for the siege and recapture of Buda castle, finally successful on 21 May 1849. The hopes of ultimate success were, however, frustrated by the intervention of Russia; all appeals to the western powers were vain, and on 11 August Kossuth abdicated in favor of Görgey, on the ground that in the last extremity the general alone could save the nation. Görgey capitulated at Világos (now Şiria, Romania) to the Russians, who handed over the army to the Austrians. The Croats had enjoyed unity with the Hungarians since 11th century, and prior to the Hungarian Revolution, the Croats held a bilateral and wealthy relationship with the Hungarians. The Croatian awareness was weak at the time of 19th century, but started to grow with increasing Hungarian pressure, especially the April Laws that ignored Croatian autonomy under Hungarian Kingdom. In response, Croatian leaders called for a distinct Triune Kingdom. Ban Josip Jelačić, who would go on to be a revered Croatian hero, sought to free Croatia from Hungary as a perate entity under the Habsburgs. Eventually, he traveled to Vienna to take oaths to become counsel of Austrian Emperor. Soon after Lajos Kossuth declared an independent Kingdom of Hungary dethroning the Habsburgs, the Croats rebelled against the Hungarians and declared their loyalty to Austria. The first fighting in the Hungarian revolution was between the Croats and Magyars, and Austria's intervention on the part of their loyal Croatian subjects caused an upheaval in Vienna.. Josip sent his army under the order of him, hoping to suppress the increasing power of Hungarian revolutionaries, but failed and was repelled by the Hungarians in September 29 near Pákozd. With the end of Hungarian Revolution, Croatia would go on to be imposed by Austria until the Croatian-Hungarian Settlement in the 1860s. Between the Tisza river and Transylvania, north of the Danube lies the former region of Hungary called the "Banat". After the Battle of Mohács, under Ottoman rule the area north of the Danube saw an influx of Southern Slavs along with the invading Ottoman army. In 1804 the semi-independent Principality of Serbia had formed south of the Danube with Belgrade as its capital. So in 1849, the Danube divided Serbia from the Kingdom of Hungary. The Hungarian district on the northern side of the river was called "Vojvodina", and by that time it was home to almost half a million Serbian inhabitants. According to the census of 1840 in Vojvodina Serbs comprised 49% of the total population. The Serbs of Vojvodina had sought their independence or attachment with the Principality of Serbia on the other side of the Danube. 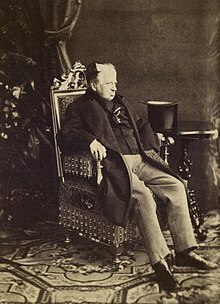 In face of the emerging Hungarian independence movement leading up to the 1848 Revolution the Austrian monarchy had promised an independent status for the Serbs of Vojvodina within the Austrian Empire. The Serbs of Vojvodina were expecting their requirement for Austrian military conscription to be the first measure to be relaxed. But the new Emperor Franz Joseph had other ideas and this promise was broken not more than two weeks after it had been made to the people of Vojvodina. This caused a split in the population of the Vojvodina and at least part of the Serbs in that province began to support the elected Hungarian Government against the Austrians. . Some Serbs sought to ingratiate the Serb nation with the Austrian Empire to promote the independence of Vojvodina. With war on three fronts the Hungarian Government should have been squashed immediately[according to whom?] upon the start of hostilities. However, events early in the war worked in favor of the Government. The unity of the Serbs on the southern front was ruined by Austrian perfidy over the legal status of Vojvodina. After the fall of the Hungarian revolution in 1849, Vojvodina became an Austrian Crown Land. In 1860 it became again a Hungarian Crown Land and was part of Hungary until the end of World War I. The Slovak Uprising was a reactionary movement to the Hungarian Revolution in the Western parts of Upper Hungary (now Western Slovakia). However, the Slovak nation siding with Vienna is a widespread modern myth - they could hardly recruit around 2000 people from Upper Hungary - in fact the number of Slovaks fighting on the other side was at least two orders of magnitude greater. The Slovaks had a much higher percentage of their population serving in the Honvédség (Home Guard) than Hungarians. The Slovak nation and people had been poorly defined up to this point, as the Slovak people lacked a definitive border or national identity. However, in the years leading up to the revolution, the Hungarians had taken steps to Magyarize the Slovak region under Hungarian control. The aim of this was to bring the varied ethnic groups around Hungary into a common culture. At the outbreak of the Hungarian Revolution this process was seen as more imminent and threatening to ethnic groups, especially the Slovaks. The Imperial government recognized that all across the Empire, ethnic minorities were seeking more autonomy, but it was only Hungary that desired a complete break. They used this by supporting the ethnic national movements against the Hungarian government. Slovak volunteer units were commissioned in Vienna to join campaigns against the Hungarians across the theatre. A Slovak regiment then marched to Myjava[clarification needed] where a Slovak council openly seceded from Hungary. Tensions rose as the Hungarian army executed a number of Slovak leaders for treason and the fighting became more bloody. However, the Western Slovak uprising also wanted its autonomy from Hungary. Slovak leaders hoped, that Upper Hungary would became part of Austrian part of the empire. Tensions with the Austrians soon began to rise. Lacking support and with increased Hungarian efforts, the Slovak volunteer corps had little impact for the rest of the war until the Russians marched in. It was used in 'mopping up' resistance in the wake of the Russian advance and then soon after was disbanded, ending Slovak involvement in the Revolution. The conclusion of the uprising is unclear, as the Slovaks fell back under Imperial authority and lacked any autonomy for some time. On 29 May 1848, at Kolozsvár (now Cluj, Romania), the Transylvanian Diet (formed of 116 Hungarians, 114 Székelys and 35 Saxons) ratified the re-union with Hungary. Romanians and Germans disagreed with the decision. Because of the success of revolutionary resistance, Franz Joseph had to ask for help from the "gendarme of Europe" Tsar Nicholas I of Russia in March 1849. A Russian army, composed of about 8,000 soldiers, invaded Transylvania on 8 April 1849. But as they crossed the Southern Carpathian mountain passes (along the border of Transylvania and Wallachia), they were met by a large Hungarian revolutionary army led by Józef Bem, a Polish-born General. Bem had been a participant in the Polish insurrection of 1830–31, had been involved in the uprising in Vienna in 1848 and, finally, became one of the top army commanders for the Hungarian Republic from 1848–49. When he encountered the Russians, Bem defeated them and forced them back out of the towns of Hermannstadt (now Sibiu, Romania) and Kronstadt (now Brașov) in Transylvania, back over the Southern Carpathian Mountains through the Roterturm Pass into Wallachia. Only 2,000 Russian soldiers made it out of Transylvania back into Wallachia, the other 6,000 troops being killed or captured by the Hungarian Army. After securing all of Transylvania, Bem moved his 30,000–40,000-man Hungarian army against Austrian forces in the northern Banat capturing the city of Temesvár (now Timişoara, Romania). However, in May 1849, Tsar Nicholas I pledged to redouble his efforts against the Hungarian Government. He and Emperor Franz Joseph started to regather and rearm an army to be commanded by Anton Vogl, the Austrian lieutenant-field-marshal who had actively participated in the suppression of the national liberation movement in Galicia in 1848. But even at this stage Vogl was occupied trying to stop another revolutionary uprising in Galicia. The Tsar was also preparing to send 30,000 Russian soldiers back over the Eastern Carpathian Mountains from Poland. Austria held Galicia and moved into Hungary, independent of Vogl's forces. At the same time, the able Haynau led an army of 60,000 Austrians from the West and retook the ground lost throughout the spring. On July 18, he finally captured Buda and Pest. The Russians were also successful in the east and the situation of the Hungarians became increasingly desperate. ^ Ödön Beöthy and Tibor Vágvölgyi: A Magyar Jakobinusok Köztársasági Mozgalma, -PAGE: 103 Budapest 1968, English: The Hungarian jacobin republican movement. One or more of the preceding sentences incorporates text from a publication now in the public domain: Bain, Robert Nisbet; Phillips, Walter Alison (1911). "Hungary" . In Chisholm, Hugh. Encyclopædia Britannica. 13 (11th ed.). Cambridge University Press. pp. 915–918. ^ Mihály Lackó: Széchenyi és Kossuth vitája, Gondolat, 1977. ^ Gróf Széchenyi István írói és hírlapi vitája Kossuth Lajossal [Count Stephen Széchenyi,s Literary and Publicistic Debate with Louis Kossuth], ed. Gyula Viszota, 2 vols. (Budapest: Magyar Történelmi Társulat, 1927–1930). ^ "március15". marcius15.kormany.hu. Archived from the original on 2017-09-17. Retrieved 2018-03-16. ^ "Az áprilisi törvények (English: "The April laws")" (in Hungarian). March 22, 1999. Archived from the original on 16 July 2011. Retrieved 28 June 2011. ^ Gazi, Stephen (1973). A History of Croatia. New York: Barnes and Noble Books. p. 150. ^ Schjerve, Rosita Rindler (2003). Diglossia and Power: Language Policies and Practice in the 19th Century Habsburg Empire. Language, Power, and Social Process. 9. Berlin: Walter de Gruyter. pp. 75–76. ISBN 9783110176544. ^ Mahaffy, Robert Pentland (1908). Francis Joseph I.: His Life and Times. Covent Garden: Duckworth. p. 39. ^ Walther Killy (2005). Dictionary of German biography. 9: Schmidt-Theyer. Walter de Gruyter. p. 237. ISBN 9783110966299. ^ Július Bartl (2002). Slovak History: Chronology & Lexicon. Bolchazy-Carducci Publishers. p. 222. ISBN 9780865164444. ^ Paul Bődy (1989). Hungarian statesmen of destiny, 1860-1960. Atlantic studies on society in change, 58; East European monographs, 262. Social Sciences Monograph. p. 23. ISBN 9780880331593. ^ Marx & Engels, p. 229. ^ "Kik voltak a honvédek". www.vasidigitkonyvtar.hu (The Hungarian Peoples' Online Encyclopaedia) (in Hungarian). Archived from the original on 25 September 2008. Retrieved 2 July 2011. ^ Források a Muravidék történetéhez/Viri za zgodovino Prekmurja. 1 (871-1849). Szombathely-Zalaegerszeg. 2008. ISBN 978-963-7227-19-6. ^ Jeszenszky, Géza (17 November 2000). "From "Eastern Switzerland" to Ethnic Cleansing, address at Duquesne History Forum" (PDF). Archived (PDF) from the original on 17 January 2013. ^ Mikulas Teich; Roy Porter (1993). The National Question in Europe in Historical Context. Cambridge University Press. p. 256. ISBN 9780521367134. ^ Ferenc Glatz (1990). Etudes historiques hongroises 1990: Ethnicity and society in Hungary, Volume 2. Institute of History of the Hungarian Academy of Sciences. p. 108. ISBN 9789638311689. ^ Tötösy de Zepetnek, Steven; Vasvari, Louise O. Comparative Hungarian Cultural Studies. p. 50. ^ Spira, György. The nationality issue in the Hungary of 1848-49. ^ Ronen, Dov; Pelinka, Anton. The challenge of ethnic conflict, democracy and self-determination in Central Europe. p. 40. ^ Marx & Engels, p. 390, 3 May 1848. ^ Marx & Engels, p. 613. ^ Marx & Engels, p. 250, The War in Hungary. ^ a b c Marx & Engels, 8 April 1848. ^ Judah 1997, p. 60. ^ "Pákozd-Sukoró Battle 1848 Exhibition" (in Hungarian). Pákozd. September 29, 1998. Archived from the original on 28 July 2011. Retrieved 28 June 2011. ^ "Isaszeg". 1hungary.com. Archived from the original on 7 July 2011. Retrieved 2 July 2011. ^ Marx & Engels, p. 603. ^ Geert-Hinrich Ahrens (2007). Diplomacy on the Edge: Containment of Ethnic Conflict and the Minorities Working Group of the Conferences on Yugoslavia. Woodrow Wilson Center Press Series. Woodrow Wilson International Center for Scholars. p. 243. ISBN 9780801885570. ^ Páva, István (1999-08-01). "Szlovákok a magyar szabadságharcban". magyarszemle.hu. Magyar szemle. ^ Centrul de Studii Transilvane; Fundația Culturală Română (1998). Transylvanian Review. Romanian Cultural Foundation. ISSN 2067-1016. Archived from the original on 20 June 2015. Retrieved 20 June 2015. ^ "Counter-revolution and Civil War". mek.oszk.hu. Archived from the original on 20 June 2015. Retrieved 20 June 2015. ^ Miklós Molnár. A Concise History of Hungary"
^ "The Gendarme of Europe". www.writewellgroup.com. 12 August 2010. Archived from the original on 26 March 2012. Retrieved 2 July 2011. ^ Marx & Engels, pp. 242, 262, 8 April 1849. ^ a b Marx & Engels, p. 319, 22 April 1848. ^ Marx & Engels, p. 242, 22 April 1848. ^ Marx & Engels, p. 334. ^ Marx & Engels, p. 611. ^ Marx & Engels, p. 343. ^ Marx & Engels, p. 304. ^ Marx & Engels, p. 346. ^ Marx & Engels, p. 331. ^ Marx & Engels, p. 293, 19 April 1849. ^ Marx & Engels, p. 303. ^ a b Szabó, János B. (5 September 2006). "Hungary's War of Independence". historynet.com. Archived from the original on 1 April 2008. Retrieved 2 July 2011. ^ "Kormányzat". gepeskonyv.btk.elte.hu. Archived from the original on 8 May 2018. Retrieved 20 June 2015. ^ "Mátyás Rákosi". September 12, 2001. Archived from the original on 15 June 2011. Retrieved 28 June 2011.